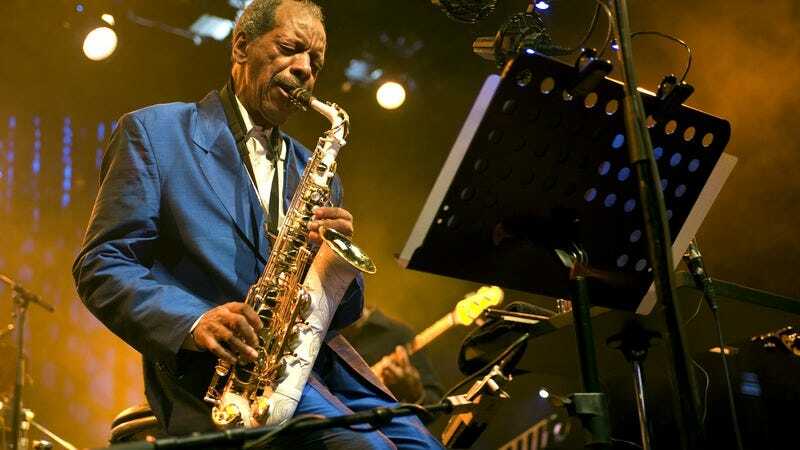 Jazz legend Ornette Coleman has died. He was 85. Coleman was both a saxophonist and a composer and, over the course of his life, became one of the more controversial innovators in his field. In the late ‘50s and early ‘60s, Coleman helped the jazz scene break from its previously rigid musical rules, expanding the genre’s borders and re-inventing the American songbook. Coleman’s own work, which had previously adhered to jazz standards and practices set by his forefathers, became more experimental, using simple melodies set against a lack of existing chord sequences. Alongside contemporaries like John Coltrane, Coleman became an advocate for the avant garde, as well as for new American individualism. Toward the end of 1961, Coleman started stepping back from jazz, taking fewer gigs and becoming more interested in discordant classical music. He didn’t perform again until 1965, when he showed up at the Village Vanguard playing not only saxophone, but also trumpet and violin. Around that same time he wrote music for a movie, Chappaqua, though those tunes were eventually rejected by the filmmaker. In the late ‘60s, Coleman bought a building in New York’s SoHo, named it Artists House, and started a sort of DIY collective that put on concerts. That led, in a round about fashion, to Coleman writing his first concerto grosso, “Skies Of America,” that was eventually performed by the London Symphony Orchestra in 1972. Billed by the Times as “the purest demonstration of his harmonic principle,” “Skies” uses Coleman’s transposed scales, leading to a kind of discord that’s both slightly startling and hauntingly melodic. In 1973, Coleman travelled to Morocco, where he started dabbling with reed players in the mountains of Jajouka. That led him into deeper exploration of Eastern tonality, something that led to his 1975 record Dancing In Your Head. His first record with his fully electric group, Prime Time, Dancing both played with non-traditional scales and drew from rock music, eventually influencing groups like The Minutemen. In 1979, Coleman appeared as the musical guest on Saturday Night Live, thus becoming one of the very few jazz artists to make an appearance on the show. He released several interesting albums in the ‘80s and ‘90s, including 1988’s Virgin Beauty, which features The Grateful Dead’s Jerry Garcia playing guitar on three tracks. In 1984, Coleman was awarded a National Endowment Of The Arts Jazz Master fellowship, and in 1994, he was made a MacArthur Foundation fellow. After forming a new group in 2004, Coleman started slowly working on new material. In 2006, he released Sound Grammar, winning a Pulitzer Prize for the LP. That same year he also won a Lifetime Achievement Grammy Award and performed at Bonnaroo, where he passed out on stage due to heat stroke. His last performance was in June 2014 at a tribute to him organized by his son and held in Brooklyn’s Prospect Park.